Why Use Us For Reputation Management? The 7 Important Points You Need To Consider BEFORE You Hire a Reputation Management Company. Then you can call us on (02) 8005 0339 for a full explanation of what we do and how we can and help with your reputation problem. 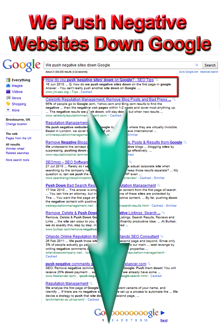 We hide negative news items, forum posts, blogs etc by pushing them down onto lower pages of the search results. It is not always easy to push items off Google. It does requires a lot of skill and experience. But we can do it. We have been doing it for many years as you can see if you take a look at our “Mentions In The Media” page on this website. So how should you decide which reputation management firm to go for? I have outlined here the key points that will save you MONEY and WASTED TIME. 1) Do the company have a solid reputation and track record themselves, with appearances on national TV, and in the national press going back several years? 2) Are they willing to meet you face to face at your offices or place of your choice in Australia to go through everything with you? We are willing to go month by month with you. You will meet or speak over the phone with our SEO Reputation Expert: David Cannell. No sales people. No juniors. We will give you a realistic quote. 6) Do they offer a cast iron guarantee that if the top negative site is not pushed down at all at the end of the first month, they will work free for a second and/or third month until it is, and if it is not pushed down at all at the end of the third month they will repay every single penny back to you? Beware of potentially misleading and useless guarantees from other firms that promise to rank positive assets [i.e. pages] on the third page of Bing. 7) Do they use cutting edge SEO & Digital Marketing techniques? Call us now on (02) (02) 8005 0339 or fill out our contact form.